Introduction: Extraosseous osteosarcomas are extremely rare. There are less than two hundred cases reported in the literature. Method: We report a rare case of primary gastric extraosseous osteosarcoma. The laparoscopic approach was utilized in resection of the tumor. Results: An otherwise healthy 72 year old female presented to us complaining of nausea and vague upper abdominal symptoms for several months. Her workup revealed a submucosal mass in the greater curvature of the stomach. An endoscopic ultrasound confirmed the presence of a 4 cm submucosal mass. The mass seemed to be arising from the muscularis propria with some inhomogeneity. No preoperative biopsies were performed. Successful laparoscopic excision of this gastric mass was then performed. The patient recovered fully with complete resolution of her symptoms. Final pathology revealed a 3.8 x 3.5 x 3.5 cm gastric extraosseous osteosarcoma with negative margins. Immunohistochemical studies were focally positive for CD34 and negative for AE1/3, S100 protein, Melan A, SMA, desmin, CD31 and KIT (CD117). The initial metastatic workup was negative. Her six months follow up revealed no evidence of recurrence. 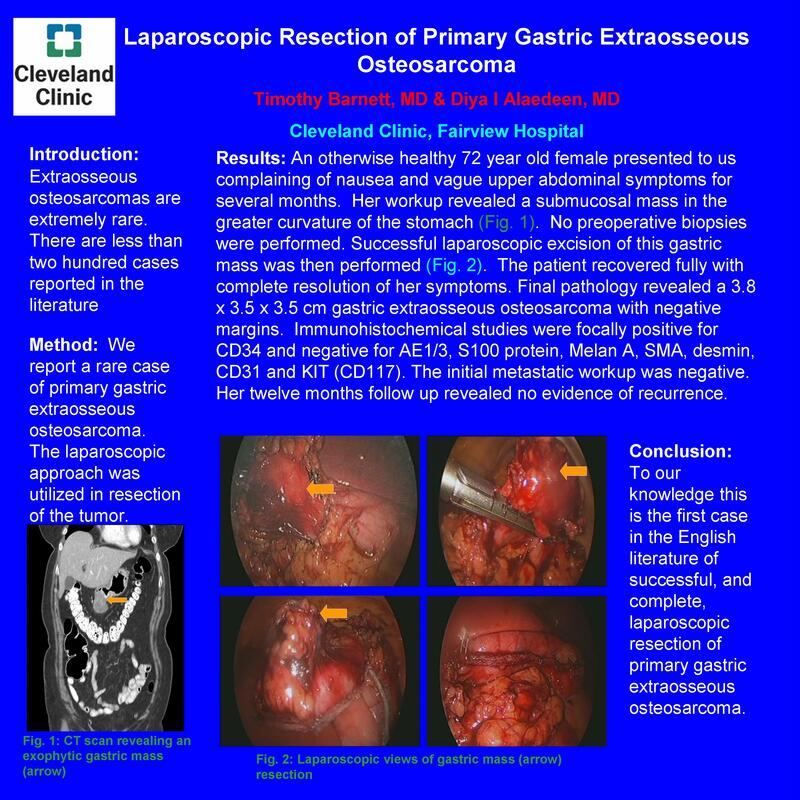 Conclusion: To our knowledge this is the first case in the English literature of successful, and complete, laparoscopic resection of primary gastric extraosseous osteosarcoma.